In the last post, we discussed the importance of a good character fit in new hires—and this applies to team building as well. Rather than recruiting exclusively for skills, remember to look at candidate attributes that will complement existing employees’ strengths. The old adage that a team is only as strong as its weakest link certainly holds true in the business world. It’s important to recognize how essential good teams are within an organization and hire with an eye on building well-rounded groups. In modern business environments, flexibility and fast problem solving are more important than ever. Teams of qualified employees can provide responsiveness and agility in ways that an individual or disjointed group can’t. Additionally, adding the social and supportive elements of a team to the workplace further engages employees, thereby increasing productivity. Remember that with shared accountability comes a sense of investment and excitement, often resulting in greater innovation and effective solution development. An amazing team is comprised of individuals who complement rather than match one another. Bringing on people with identical skills and experiences isn’t the point. Albert Einstein once explained that we can’t solve problems with the same kind of thinking we used to create them. By diversifying the background and problem solving capabilities each person within a team has, you’re building a strong and dynamic force within your company. To ensure teams are well composed, let Lifestyle Retail Recruiters conduct comprehensive candidate interviews. The personality, strengths, weaknesses, and work style of each is balanced against your company’s needs during these closed and confidential processes. A professional and experienced outside eye is often capable of seeing gaps within groups that aren’t apparent from the inside. 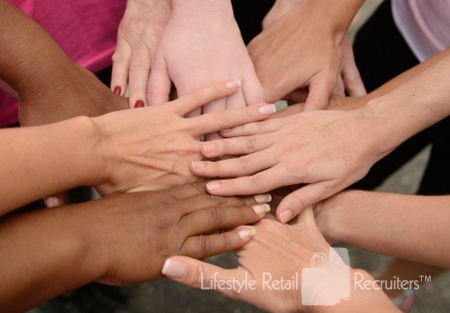 Lifestyle Retail Recruiters are experts at identifying traits that will complete and complement an existing team. Teams work best when expert leadership is provided. In the next chapter, we’ll take a look at how to hire and promote amazing leaders within your organization.